Do You Need Help Building & Monetizing An Audience So You Can Sell Your Expertise? If you’re reading this then that means you’re interested in having one-on-one sessions where I help you build and monetize your audience. Yeah yeah, it sounds like I’m trying to use reverse-psychology on you but that’s not what I’m doing. I focus on helping you market yourself to produce revenue. Period. If your number of followers is bigger than your bank account then you’re building your business wrong. People work with me because I get them focused. I create clarity about what needs to get done and help them do it. I help you get into “tunnel-vision” mode. We don’t go over a million different ‘methods’ that make you feel overwhelmed. Instead, people want me to figure out exactly what they need to do and help them get it done. Take Dave Davlin for example. He’s an entertainer and he wanted more gigs. Before working with me, he was literally praying to God that someone would help him with his marketing. 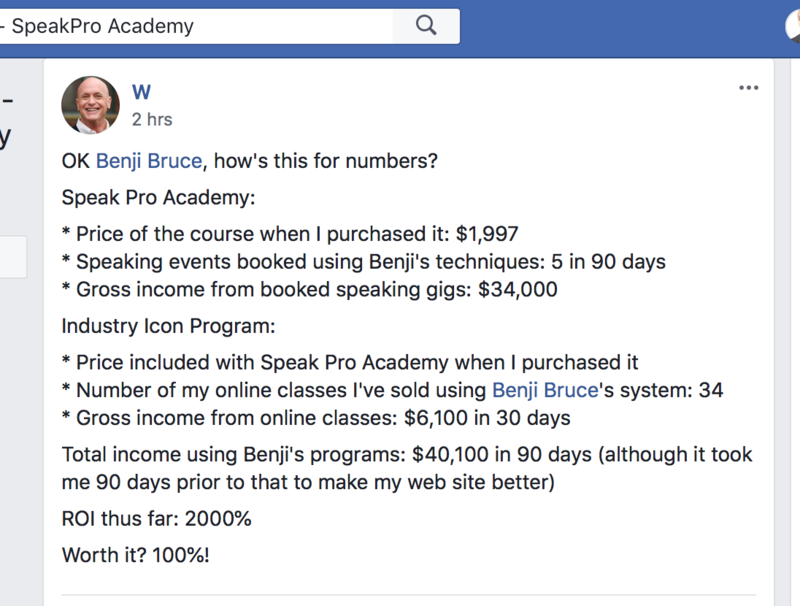 And within a year he ended up doing almost a quarter-million. First, we worked on his website. And then Dave mastered the event finding process. He got a CRM and put our sales process in place. 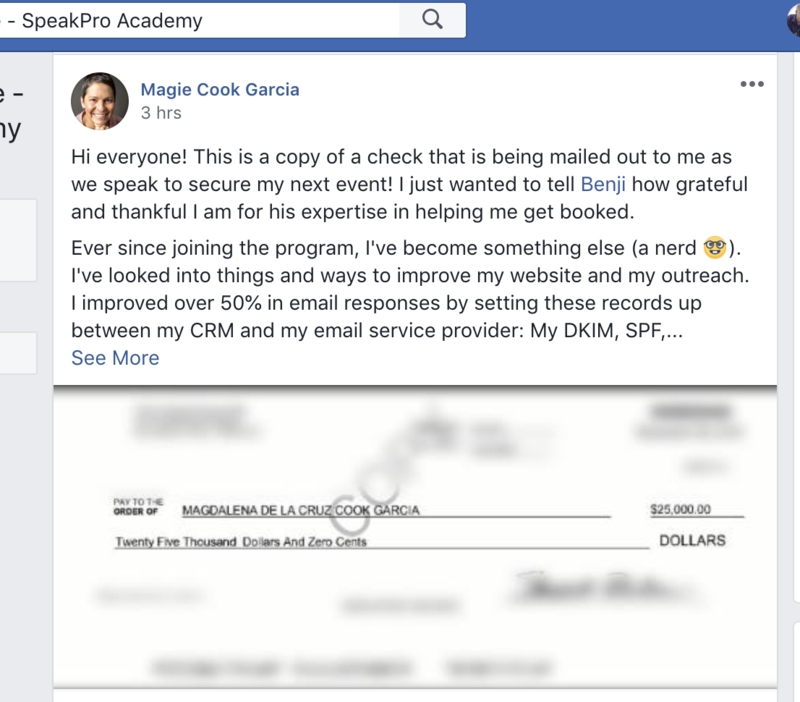 The CRM & sales process allowed him to get clear on what to do from start to finish to get booked. He put the email templates in place so he knew exactly what to say to events and how to follow up. Then he went into beast-mode and followed the process we laid out for him. In fact, he contacted so many events that he was getting boggled down in the responses. Magie was a rockstar from the beginning. She’s a speaker and she wanted more speaking gigs. So she was wondering how to go about marketing herself. She knew little about websites or any of the technology but this was her dream so she acted fast. She got her website up in 2 days using the website templates we mentioned. Then she became obsessed with the sales process for finding and contacting events (not ‘followers’ and ‘likes’). Within 3 weeks she booked 3 gigs. Bob lives in Canada so he was wondering if this would work in another country. So what’s the first thing we did with Bob? Will was already featured on Oprah, Dr. Oz, and several other TV shows before coming to me. He was hungry for more. Should he produce more content? Podcast? Do outreach? I gave him access to our online program and got him in ‘tunnel-vision’ mode with his marketing. They’re clients I work with. We uncovered and focused on the activities that generate revenue. And it’s different for everyone. Imagine what would happen if you went full-force on building and monetizing your audience. Most people are creating content and getting nowhere. They’re not making sales and feel like they’re running in circles. Imagine what would happen if you decided to go all-in and went into tunnel-vision mode. ….You don’t have to worry about implementing a ton of ‘tactics’ you don’t have time for. …You don’t have to put more on your to-do list. In fact, we will be taking things off your list (to get you focused on what matters). All you have to do is go into “tunnel-vision” mode with the things I tell you. And let’s be clear, my focus is on generating revenue, not ‘likes’ and ‘followers’. Does this sound like something you want? I can help you, but there’s a catch. Getting results doesn’t happen overnight. It takes time and real work on your part. If you can’t commit, then wait until you’re mentally ready. In order for me to help you, I need to work with you for at about a year. This is expensive. It’s $60,000 for the year. And there are no payment plans because you can either afford it or you can’t. And I’ll be honest with you. The number one thing I’m looking from you is Speed Of Implementation. If for any reason I think you won’t implement fast (or at all), then I’ll deny your application. You don’t need to have a big business already, you just have to do the work. I created an application process to weed out flakes and time-wasters. If you feel like this is right for you then click the “apply now” link below and start the application process. P.s. We will have one call per week and you will have my personal cell number so you can text with any problems you’re having. Also, I want to be VERY clear about something. First, the numbers I gave you are the numbers they disclosed to me. It’s not like I had a team of IRS agents double-check their revenue for me. I took them at their word. Plus, another person’s results have zero correlation to your results. There’s no way I could know what results you’re going to get because I don’t know your work ethic. I’m sharing their stories with you to show you the power of getting clear about what needs to get done, and getting insanely focused about making it happen. If you’ve had success then you already get this. You know what one person does has nothing to do with what you do. I just wanted to make things clear upfront. Enter your details below to request your invitation. Sessions are first come first serve.